King prawns are the most popular species of prawn in Australia, due no doubt to their rich flavour and moist flesh. They are extremely versatile and excellent for display purposes. Suggested coatings include batters (regular or tempura) with a touch of saffron. Crumbs made from brioche make a good match with the sweetness of the prawns. Blend in saffron, turmeric, cumin or ground coriander for added flavour. Cook the prawn in the shell as this will keep the juices and flavour inside. It can however make the prawn messy to eat and impossible to devein prior to serving. If the prawn is cleaned first, leave the tail tip and head on for good presentation. If curried prawns are on the menu, use a light style of curry with coconut milk so as not to overpower the flavour of the prawn. Prawn cocktail is always popular and can be made more exotic by adding mango or fresh citrus fruits and light dressings or mayonnaise. Appropriate sauces and accom-paniments for king prawns include chilli, coriander, citrus, garlic, curry (light), ginger, tropical fruits, burnt butters, basil (pesto), mayonnaise and vinaigrettes. Price King prawns are high-priced prawns. Price depends on grade. Large prawns (U-10s) are higher-priced than small prawns (21 – 30s). Western and redspot king prawns are often cheaper than eastern king prawns, as they are more commonly sold frozen. Edibility Flesh and roe. The head and shell are also eaten in many Asian dishes. With deep fried prawns, where the traditional accompaniment is may-onnaise-based such as tartare sauce, select moderately robust white wines with substantial acidities to balance the residual oiliness and egg solids from the mayonnaise. Try young Hunter Valley semillons or medium-bodied white blends from South Australia. For barbecued or sauteed prawns with spiced Asian dipping sauces (chilli, coriander or ginger flavoured), try sweeter or fruitier wines such as Eden Valley rieslings, or traminers. Year round, with peak supply from February through June. The king prawn fishery is closed from December through March and again in July in the Northern Territory. Various trawl fishery closures occur in Queensland in spring and summer. 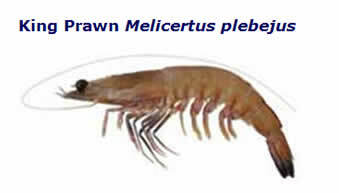 With their fairly clear tannish shell and blue tail ends, king prawns present well raw or cooked. The redspot king prawn is easily recognised by the red spot on the third tail segment. Large ocean king (L.O.K.) prawns (eastern king prawns) command high prices. Grading Grading can vary by supplier and region. One example of a grading system for all prawns is presented below. Data presented are for eastern king prawn.